EghtesadOnline: Luxury lakeside homes and high-rise condominiums are coming up fast in China's sleepy inland town of Bengbu, a clear sign that a home-buying frenzy sweeping across the country's major metropolises and provincial capitals has reached even its smaller cities. The increase in demand is welcome news for smaller cities that have a massive overhang of unsold houses left from the last real estate downturn three years ago. However, the surge in construction threatens to outpace or match the increased demand for housing, leaving housing inventories untouched, Reuters reported. That will be a worry for China's policymakers, who want to keep the real estate market stable ahead of a once-every-five-years Communist Party congress in the autumn that will see a reshuffle of senior leaders. The property market in Bengbu, once a fishing village on the banks of the Huai River and Lake Longzi, has been among the top three fastest-growing in China's 70 main cities in recent months although the local economy is soft - the region's main glass-making industry has been hit by the general growth slowdown. Real estate in tier-3 and tier-4 cities, ranked below the major metropolises and the provincial capitals, is where the growth is now, analysts say, but the frenzied construction means the stock of unsold homes has remained stubbornly high. Nearly 50 million square meters of real estate, or about 550,000 homes, were sold in 27 tier-3 cities in January-May this year, which should have reduced inventories by 45 percent, according to Reuters calculations based on a private estimate of inventories in China's main small cities. In reality, inventories only dropped 7.1 percent to 102 million sq m, equivalent to 1.1 million homes, data by Shanghai-based E-house China R&D Institute showed, because of new construction. Prices for new homes in Bengbu surged 3.4 percent on-month in May, the highest among all 70 major cities, data from the Statistics Bureau showed. Bengbu ranked second-highest in April and third-highest in June. "We think the market will continue to be good even though we don't expect a drastic rise in prices anymore," said a manager surnamed Huang at Bengbu Jinhui Real Estate, a private developer that has actively bought land rights in Bengbu. A unit of Kingyard Real Estate, the firm successfully bid 1.39 billion yuan ($205.4 million) for a nearly 12,000 sq m (3 acres) parcel of land in Bengbu in May, more than double the starting price, where it plans to build residential housing. In Bengbu, housing inventories hit a high of 4.84 million sq m in January 2016, which at the time would have taken more than 40 months to clear. But despite sales jumping almost 70 percent to about 1.47 million sq m in the first half, the excess stock only decreased about 4 percent to 4.39 million sq m as of May, E-house's latest estimates showed, due to new supplies entering the market. Developers obtained pre-sale permits to sell 1.12 million sq m of new projects in the first half, with permits in June up more than 400 percent from a year earlier, according to Reuters calculations based on Bengbu housing bureau data. The propaganda office of the Bengbu government declined to comment, and phone calls to the city's housing bureau went unanswered. Property prices have jumped almost 50 percent since the start of the year for some new units to around 7,500 yuan ($1,108) per sq m, according to local agents. At those prices, a two-bedroom apartment of 90 sq m would cost about 675,000 yuan ($99,956) before tax, equivalent to 12 years of average pay in the city. 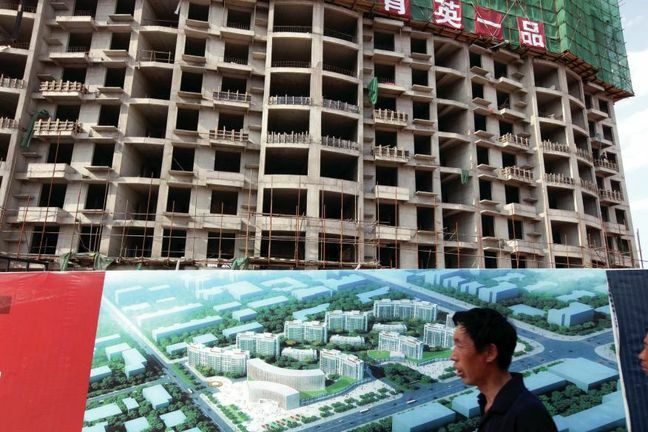 Many recent buyers are locals originally from Bengbu and its neighboring counties but have gone to more affluent cities for work, said Shen Zhichao, sales manager for Amber New World, a housing project under Hefei Urban Construction HEFEIA.UL. Having seen the rapid price gains in bigger cities, they are rushing back to secure apartments before even those get too exorbitant. "I feel too much potential demand has already been front-loaded to the first half of the year," Shen said. Bengbu's government capped prices of new projects at 5,800 yuan ($859.45) per sq m on May 15, as the city became the fastest-growing market in China that month. The new rule does not affect housing projects that have been granted a selling permit. Some developers have also sought to offer cheaper units on lower floors so the average selling price for the entire project doesn't exceed the cap. The hidden danger, analysts say, is that real estate inventories are often higher than indicated by official figures. Official inventory data only counts completed homes, while private estimates include homes that are being built but not completed yet. Official data showed nationwide inventories stood at 646 million sq m as of end-June. Private estimates, which tend to lag official data, can be several times bigger than that. A Bank of China estimate that includes not-yet-built projects shows China's real estate inventories stood at 8.28 billion sq m at end-2016, most of which - 5.8 billion - in tier-three and four cities.